Members of the IIMS came from far and wide to celebrate the Institute’s 25th anniversary and silver jubilee in London on 31 August and 1 September 2016. Three iconic venues across the city had been chosen to mark this special occasion in what turned out to be two action packed days. Regent’s University, set in the heart of one of the jewels of London, Regent’s Park, is a splendid building dating from the 1920s. 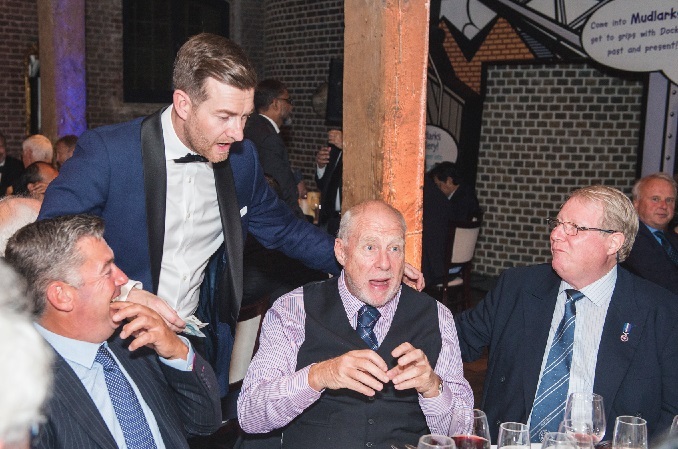 The Gala Dinner was held in the historic Museum of London Docklands, dating back to the early 1800s. And the second day, comprising ten presentations, took place in the splendour and serenity of The Old Library, Lloyd’s of London. The first day opened at Regent’s University, the centrepiece of which was the delightful Herringham Hall. Delegates had five technical workshops to choose from. Presentations took place in two elegant spaces within Regent’s University, namely the Tuke Common Room and the Knapp Gallery. The range and depth of presentations was far reaching and from feedback received, all were of great interest. Nick Smith from Charles Taylor Adjusting covered the fascinating subject of commonly breached warranties for small craft and their implications for insurers and insured. IIMS member, Luc Verley (based in Singapore) talked passionately about dredging technology and gave an insight into his audience about the perhaps little known world of dredging contractors, projects and the equipment itself. The next two presentations of the morning could best be described as ‘chalk and cheese’. Representing FLIR UK, the leading provider of thermal imaging equipment, John Reynolds gave an overview of the products currently available to surveyors and their potential uses. He brought a range of equipment for surveyors to trial and play with. Whilst over in the Knapp Gallery, seasoned veteran, Sam Ignarski, co-founder of FOB Network, a networking platform for the maritime classes, and editor of Bow Wave and co-publisher of The Maritime Advocate, extolled the virtues of social media to an eager audience. Carol Powell, one of the foremost experts in corrosion in the UK, brought the morning’s proceedings to a conclusion. In her presentation to a sizeable audience, Carol spoke eloquently and knowledgeably about marine alloys, their corrosion behaviour and how to avoid it. Despite being an age old problem, there is clearly always new thinking and evidence to review on this most fundamental of topics that a surveyor just has to understand. IIMS is most grateful to the five speakers who came to present their technical workshops. Videos were made of Nick, John and Carol’s presentations and will soon be made available to IIMS members via the web site or YouTube channel. During the morning, delegates were free to mingle around the small exhibition in the Herringham Hall and to network with other members. 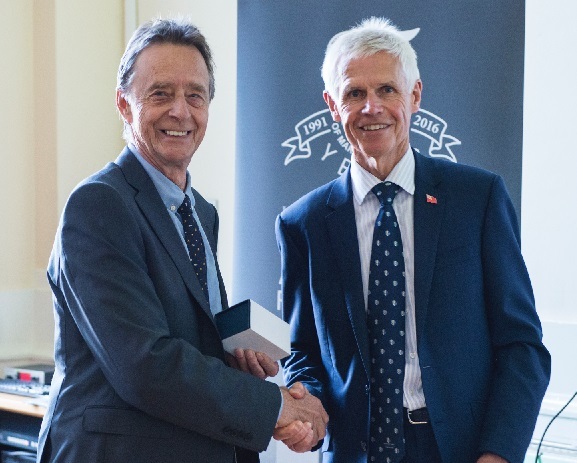 Following a lovely, stand up buffet luncheon, the IIMS Silver Jubilee Awards for Excellence in Marine Surveying swung into action and were presented in a packed Herringham Hall by Sir Alan Massey, Chief Executive Officer of the UK Maritime & Coastguard Agency. After luncheon and a quick room set up change, the Institute held its AGM, which featured the transfer of the Presidency from Capt Bertrand Apperry to Mr Adam Brancher. Surprises aplenty had been promised for the 25th Anniversary Gala Dinner and guests were not disappointed! Indeed the first surprise guests encountered were two fearsome looking pirates on stilts waiting by the front door of the venue to meet and greet. And what a menacing pair they made too. 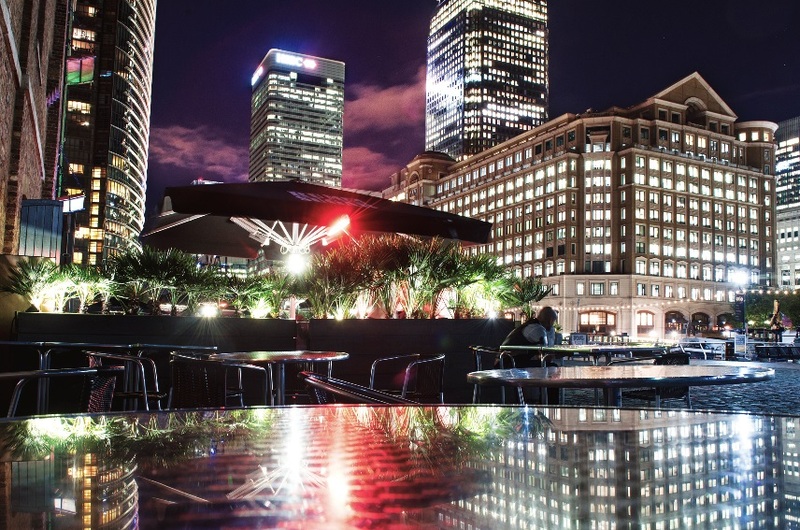 Guests assembled from 18.30 in the shadow of the imposing Canary Wharf skyscraper in London’s now fully transformed and prosperous east end. After time to take in the museum’s exhibits, guests headed for the ‘Sailor Town’ area, a space which has been used to recreate an old Victorian quayside scene, for a special drinks reception, wandering quietly through the dimly lit and atmospheric streets with their drinks. The Museum of London Docklands was originally No. 1 Warehouse of the West India Docks. Opened in 1802, the West India Docks were London’s first enclosed dock system, built away from the open river on the Isle of Dogs. Following the drinks reception, guests headed downstairs to the imposing, high ceilinged Muscavado Hall for dinner. Capt Barry Thompson read a specially selected poem of remembrance entitled ‘Lost at Sea’ by Lillian Harris. Immediate Past President, Capt Bertrand Apperry, delivered Grace; and new President, Mr Adam Brancher, proposed the Loyal Toast to Her Majesty the Queen. Head chef Joe and his team of talented chefs had been tasked with creating a unique international buffet to reflect the nature of the global nature of IIMS, befitting of this special occasion. He and his team did not disappoint, delighting guests by preparing a lavish selection of cuisine with the countries of India, China, Italy, America and Australia as their primary sources of inspiration. 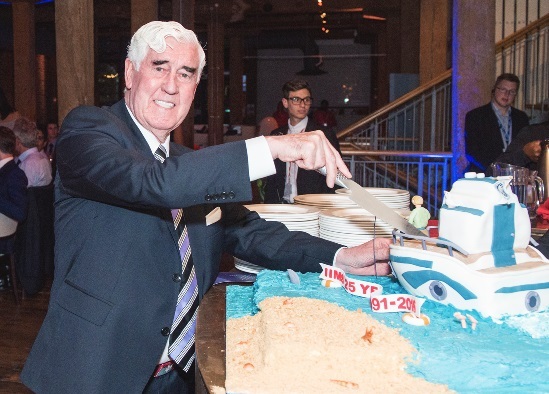 A special 25th Anniversary cake in the shape of a boat had been specially commissioned and it fell to Capt Bill (William MacDonald), the Institute’s founder and first President to perform cake cutting duties, which he fulfilled with some style too. During dinner, guests had been richly entertained by Ivo the caricaturist, who amazed people with his fast and accurate sketching abilities; and by close up magician Keven Starl, whose skill at deceiving the eye was quite simply astonishing. Some of his magic and trickery simply defied logic and belief. Three speakers (and a brief, frivolous comedy routine) brought the evening to a close. First to speak, Mike Schwarz, IIMS CEO, praised the management board, regional directors and head office team. He made presentations to Vicky Lawrence, Financial Controller, for 10 years’ plus service. He also recognised the work of Membership Secretary, Jan Cox, for whom this conference would be her last with retirement early in the New Year looming with a further presentation. Mike acknowledged the eight past Presidents who were present at the event. His final presentation was to Capt Bill (William MacDonald), the founder of the IIMS. Recognising his foresightedness and ambition all those years ago, Mike presented Capt Bill with a specially engraved glass crystal. Mr Michael Grey was next to speak. He continued in a similar vein challenging the audience to think about where the next generation of surveyors might come from and how they are to be trained to become competent. There followed a highly unusual interlude following Michael’s speech. Mike Schwarz and Peter Hancock took to the stage to perform a specially scripted routine to remember the ‘Two Ronnies’ duo, a famous British comedy double act. Back in 1991 when IIMS was formed, Ronnie Corbett and Ronnie Barker (The Two Ronnies) would regularly command television audiences of 20 million plus viewers on a Saturday night and at Christmas with their unique style and brand of humour. As a mark of respect to these two greats, Mike and Peter delivered the ‘spoof’ news headlines in the manner of the Two Ronnies and amused the audience. And so it fell to Peter Hancock to bring the evening and Gala Dinner to a close. Bravely returning by popular demand, Peter used his skills to deliver twenty minutes of wit and. A collection was made for President Adam Brancher’s chosen charity, which this year was MIND, the mental health charity. A sum of £500.65 was raised and thanks are given to those who generously donated to this worthy cause. Special thanks were given to the two main sponsors of the day, Capt Zarir Irani, Constellation Marine Services (Platinum sponsor) and Allen Brink, A R Brink & Associates. Delegates were on parade bright and early to hear the new President, Mr Adam Brancher, give his first address to Conference. He said how honoured he was to have taken over the reigns as President of IIMS. He was followed to the stage by Mike Schwarz who spoke about developments at IIMS over the past few months before peering into his crystal ball to come up with some ideas of what the Institute might look like by 2041 in another twenty five years’ time. The next presenter, John Guy, a veteran of the very first IIMS Conference a quarter of a century ago, talked about crisis management, a subject dear to his heart. He made the point that an event is only a crisis if the media deems it so, saying that killing seafarers can often pass without comment, but harming beautiful beaches with oil spills, or killing thousands of penguins is determined to be more a far more heinous crime by the media. 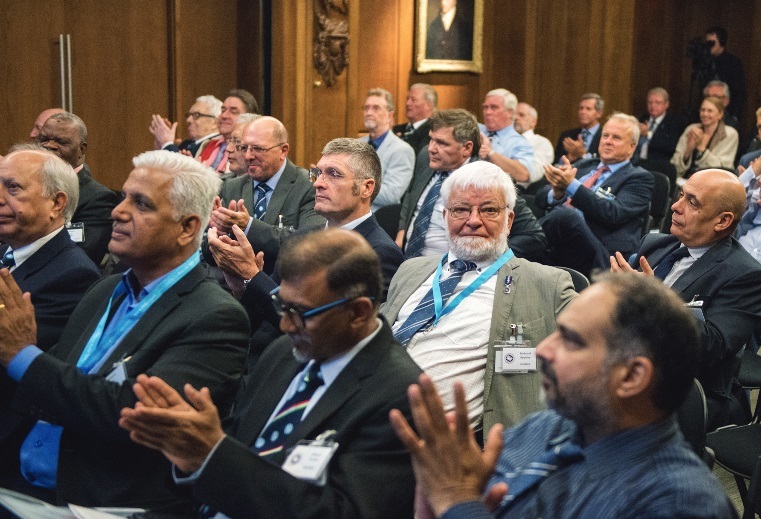 IIMS was delighted that Philip Wake OBE, Chief Executive of the Nautical Institute (our friends and media partners for the event) has accepted an invitation to speak. Philip tackled the challenging subject of Maritime professionals or automatons? Brave new world or not? His view was very much one that whilst autonomous vessels are coming, it may be longer than anticipated before they make a big impact. Capt Peter King presented his vision of the next generation of marine surveyors in which he argued the case for an apprenticeship scheme. His colleague, George Brown, a young and upcoming surveyor, joined him on stage to say a few words about his experience so far, incorporating something akin to an apprenticeship route into the industry. Future challenges facing marine insurers was the topic tackled by Chris Curran. After a look back in time to the background of the marine insurance industry, he turned his attention to what might lie ahead. Once again the subject of autonomous vessels was mentioned and the potential ramifications for underwriters. James Harrison, co-founder of Sky-Futures Ltd, who had picked up the Innovation Award the previous day, gave a far reaching and insightful presentation, largely focusing on the impact that drone technology is having on the marine industry. He also won the prize for the most innovative presentation title of the day – Bringing the assets to the experts – meshing visual, telemetry, 3D and other complex data types to enable advanced asset assessment from your desk. The case study of the m/v Happy Star Big Lift project was presented by Capt Andrew Korek. This presentation had been held over from last year’s conference due to Drew’s ill health. He spoke about the many challenges he faced, some of which all but prevented the project happening. Mighty Ships have made a television programme about the project, but as Drew was quick to point out they chose to show viewers the more palatable bits! Safety management systems continue to be on the industry’s lips day in and day out. In is informative presentation, entitled Boxing and Dancing: The Broken Promises of Safety Management Systems in Global Shipping, Nippin Anand from DNV GL spoke openly of his concerns about why safety is often overlooked and why lessons are seemingly not being learnt. Dr Alexandros Ntovas delivered the final presentation of the day and gave an in interesting overview of the impact of autonomous vessels calling on his experience as an oceanic policy advisor and with a knowledge of the law of the seas. His presentation was entitled unmanned commercial vessels: What may lay ahead for marine surveyors in the context of classification. The second day of Conference concluded with a panel question and answer session. Adam Brancher, Capt Zarir Irani, John Excell and Phil Duffy joined Mike Schwarz on stage, as he posed some questions about the Conference. The audience was then invited to pose questions and duly did so. All the presentations on day two were filmed and will be released as videos very soon through the IIMS web site and via the Institute’s YouTube channel.